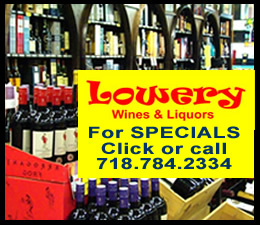 August 30, 2015 / District 23 Queens Neighborhoods / Queens Politics / News Analysis & Opinion / Queens Buzz. Continued. 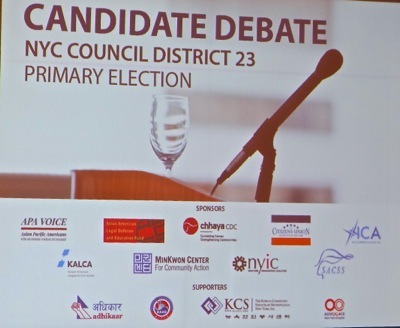 The following is a continuation of the questions and answers by the candidates running for the NY City Councilmember position in District 23 in Queens NYC. 6. Will the candidates support the recognition of the Hindu religious holidays of Diwali and Holi as public holidays? Najmi said yes, stating that it shows government recognition of the people who live here. Lynch agreed saying it provides an opportunity for children to learn of their classmates' cultures. Dosamantes agreed with Najmi and Lynch. Friedrich said no, we already have too many holidays. He proposed providing parents with floating holidays which they could use to pull their children from school. Grodenchik said no, agreeing with Freidrich. 7. Are they for efforts to stop the bullying of LGBT kids in school? All said yes. 8. What should be done about the uneveness in public schools performance? Cardozo is a high performing public school while Martin Van Buren is a low performing public school. Dosmantes wasn’t sure that Mayoral control was necessarily a good thing. She advocated for local control. Grodenchik said that Jamaica High School is now four separate schools. Friedrich said that all of his opponents are opposed to charter schools and that he is for them. Lynch said that part of the reason the schools don’t perform well is inadequate infrastructure. She noted that there have been trailers serving a portion of Martin Van Buren public school for 15 years. Najmi said that class size matters and that it should be illegal for schools to have any class larger than 25 students. In the next portion of the program the candidates could ask one question of any of the other candidates. This exercise was followed by closing remarks by each candidate. Barry Grodenchik left the forum before this part of the program, which we captured in a video of the exchanges and closing remarks [see below]. Ali Najmi, aged 32, is an attorney and community organizer. Najmi picked up endorsements from independent Democrat Zephryr Teachout, a previously unknown Fordham Law Professor, who lead an unfunded social media and internet campaign against a well-financed Governor Andrew Cuomo and - in a huge surprise - won 40% of the vote. Najmi also picked up an endorsement from independent NYC City Councilmember [hereafter CCM] Danny Dromm from Jackson Heights and from UNITE HERE Local 100 which cited Najmi’s work in helping them fight for higher wages. He is also a founding member of the Muslim Democratic Club. Najmi has been one of the top performers in fundraising, alongside Grodenchik and Lynch. Najmi has a website and a strong web presence on Facebook with 2059 Likes and 1309 Twitter followers. He is well ahead of all other candidates in using electronic media. 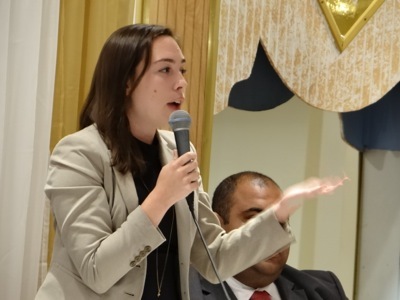 Rebecca Lynch, aged 27, is a former member of Mayor de Blasio’s Community Affairs department and former Democratic District leader. Lynch picked up endorsements from Queens CCM Jimmy Van Bramer and NYS Assembly woman Nily Rozic of Fresh Meadows. The bulk of Lynch’s endorsements appear to come from outside of Queens including endorsements from NYS Senator Gustavo Rivera from the Bronx, CCM Richie Torres also from the Bronx, CCM Corey Johnson of Manhattan and CCM Brad Lander of Brooklyn. These endorsements first appeared to us to have been developed while she was a member of and through the support of the de Blasio administration, but her campaign informed me that this is not the case - but they did not provide any additional information. The NY Observer stated that Lynch also has endorsements from the Working Families Party, and unions such as 32BJ SEIU [which represents doormen, custodians and security guards], the Hotel Trades Council and the Building and Construction Trades. Lynch was one of the top fundraisers. The NY Observer notes that she received help from Renee Cafaro, a Democratic consultant / fundraiser who has also held fundraiser(s) for Hillary Clinton. Lynch has a website and has 1004 Likes on Facebook and 229 followers on Twitter . On Lynch's campaign handout, New Hyde Park was listed as a Queens neighborhood and apparently a very small segment of it is. We learned something here, as both Wikipedia and Google [see maps and definitions above] have it listed as part of Nassau County, but Wikipedia notes that a small segment of it resides in Queens. 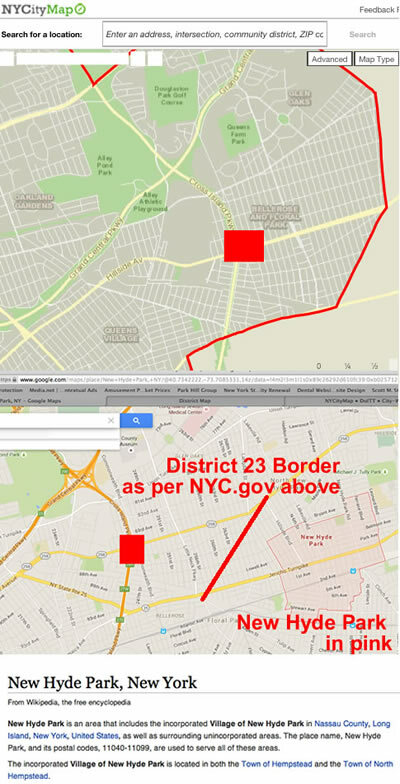 Also, according to the NYC.gov website map, New Hyde Park as outlined on Google maps does not appear as a part of District 23 either [see map above]. But that said, the Board of Elections confirmed that a very small part of New Hyde Park is in fact a part of District 23. Barry Grodenchik, aged 55, is the Queens Democratic Party backed candidate. Grodenchik is a career government official who served as the Queens Deputy Borough President under Helen Marshall, as well as working for former Queens Borough President Claire Schulman. Grodenchik also served a term in the NYS Assembly. 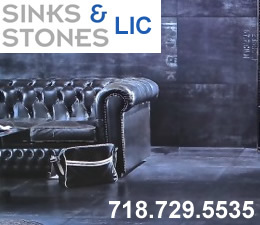 Grodenchik has also worked for the Parkside Group, which is a political consultancy that helps candidates get elected and helps companies navigate New York City and New York State governments, which are comprised in part, of the government officials the Parkside Group helps get elected. According to the Queens Tribune, Grodenchik's Democratic Party endorsements come from former CCM Mark Weprin who recently resigned the District 23 NYC City Council seat, NYS Sentor Jose Peralta, NYS Assemblyman Francisco Moya, NYS Assemblywoman Catherine Nolan, Queens Borough President Melinda Katz, the Fire Department, Transport Workers Union Local 100 and Pastor Floyd Flake of Jamaica. Grodenchik was one of the top fundraisers, believed to be due in part, to help given by the Queens Democratic Party. He has a website and an active Twitter account with 195 followers. Bob Freidrich is the Glen Oaks Village President. According to a Queens Tribune report, Friedrich has run for the 23rd District NYC City Council Member position in the past as both a Democrat and as a Republican. Friedrich told us he has been holding protests at the former Merrick Academy charter school which is the proposed site for a juvenile detention center on Jamaica Avenue in Queens Village. Friedrich's ability to raise funds was at the lower end of the spectrum. Friedrich has a website, but I couldn’t find any social media that didn’t require me to log in. 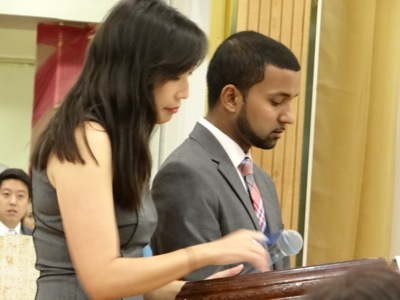 Dosamantes, aged 25, has worked as a staffer for NYS Assemblyman David Weprin, spent nine months as an Executive Assistant for U.S. Congresswoman Grace Meng, and was Deputy Chief of Staff for NYS Assemblyman Phil Ramos. Dosamantes was at the lower end of the fundraising spectrum. Dosamantes didn’t receive any major endorsements. I couldn’t find Dosmantes' website in the first couple of search pages using her name, but she does have one, which I learned in a follow up telephone call to her campaign office. She has a Twitter account with 17 followers. 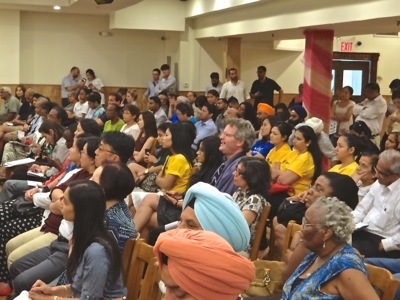 Satnam Parhar is founder of Sant Baba Nidhan Singh Ji Cultural Society Temple in Bellerose, and he is the President of the India Association of Long Island in Hicksville. 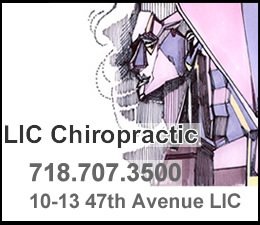 The latter association serves the far eastern parts of New York City. A Queens Chronicle story stated that Parhar is from New Hyde Park, only a small bit of which as noted above, is located in Queens. 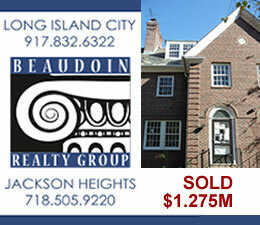 Most of New Hyde Park is located in Nassau County on Long Island. 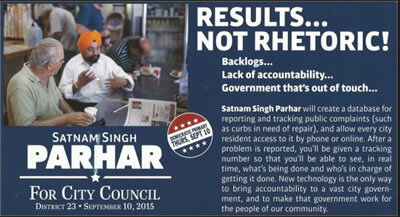 Candidate Najmi alleges that Parhar lives in Cedarhurst on Long Island in the video below. Parhar was in the middle of the pack in terms of fundraising. He did not appear at the forum, but there were two men, one of whom was very outspoken on his behalf when his residency was questioned by Najmi [see video for the interaction]. Parhar received an endorsement from NYS Senator Tony Avella. 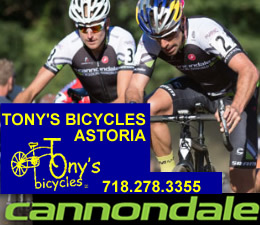 See more about the Tony Avella endorsement in the analysis below. Parhar has a website and a Twitter account with 63 followers. A June / July 2015 Parhar campaign flyer promoted plans to implement 311-like service in Queens. Queens District 23 already has a 311 service in place, as does the rest of NYC. 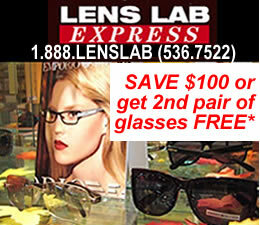 See the flyer above and this was also captured in the video below. The following video includes the final candidate-to-candidate questions and candidate closing statements. These were the only part of the debate that I videotaped. Candidate Barry Grodenchik left the forum early, so he was not present when I shot the video; nor was Satnam Parhar and Joe Concannon (R) - neither of whom were present at the forum at any point. 1. Lynch embraces Dosamantes with a female-friendly gender question about running for office. This made sense as an effort by Lynch to reach out to women in the South Asian community through a friendly interaction with Dosamantes, focusing on gender equality issues. 2. Najmi goes after Grodenchik by calling Grodenchik out regarding a statement made by Grodenchik in an interview with the Queens Chronicle wherein Grodenchik said he “believes there is a place for stop and frisk if carried out judiciously”. 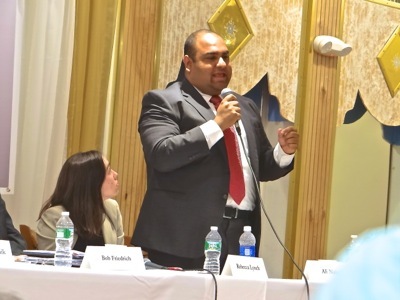 Najmi’s effort to confront Grodenchik was expected, as Grodenchik is the front running candidate who is backed by the Queens Democratic Party. 3. Dosamantes and Friedrich go after Najmi on his investigations into the voter registration documents of Dosamantes and Parhur. This made sense as Najmi appears to be the leading candidate in the South Asian community, which was well represented at the event. We provide context for Najmi's investigations in our analysis below. 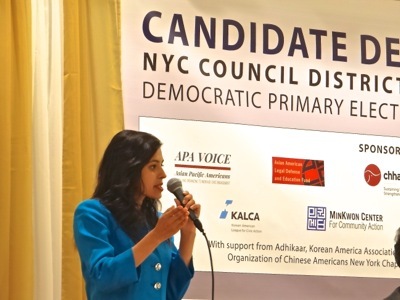 The reasons Najmi’s lawyer likely recommended that his campaign look into Dosamantes’ and Parhar’s registrations is because of the history of alleged Queens Democratic Party Machine ballot maneuvers, wherein straw candidates are placed on the ballot to draw votes away from credible contenders. This is not a new trick. Joe Kennedy, President Kennedy's father, made sure there were two Tony Russos on the ballot in JFK’s first Congressional race in the 1940's - thus splitting the Russo vote. 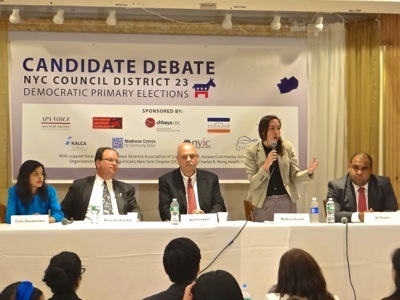 While covering the 2013 Queens Borough President race, one of the electorate alleged that the Queens Democratic Machine was behind Tony Avella's candidacy for Queens Borough President. 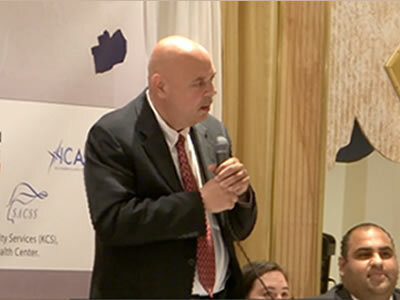 They claimed that putting Avella's name on the ballot was intended to draw votes away from Peter Vallone – as both candidates are Italian and male. Avella dropped out of the race shortly after his name was securely placed on the ballot, and Vallone lost the race to Melinda Katz by something very near the exact amount of votes cast for Avella. It's worth including a mention that NYS Senator Tony Avella both challenges and collaborates with the Queens Democratic Party machine. He's one of the more complicated, but also more talented, government officials representing Queens. Thus, since both Dosamantes and Parhar have some South Asian heritage and both have identifiable ethnic group names, their presence on the ballot will - regardless of the strength of their candidacies - draw votes away from Najmi from within the ethnic communities. Thus Najmi’s look into the veracity of their filings, shows that he understands how the system works, did his homework, and took responsive action. Grodenchik has Queens Democratic Party backing while Lynch appears to have the backing of the de Blasio administration [Progressive Democrats]. But, as noted above, a significant portion of Lynch's support base appears to come from outside the District 23 neighborhoods, and even from outside of the borough of Queens. 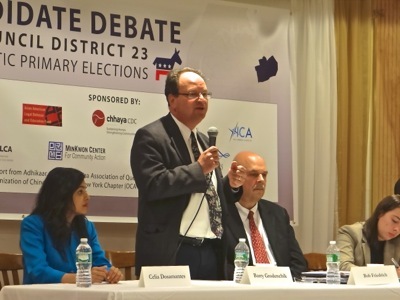 Massachusetts Congressman Tip O’Neill, who was the Speaker of the U.S. House of Representatives through three presidencies, used to tell people that “All politics is local”, so how useful this out-of-borough support in a Queens NY City Council district election is worth pondering, particularly for those seeking to support a successful challenge to the Queens Democratic Party Machine. 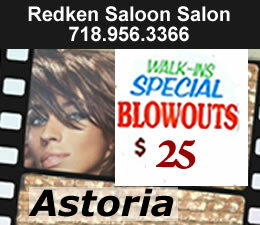 It is estimated that about 8,000 votes will be cast in the Queens District 23 NY City Council election. Hence, given there are six candidates in the Democratic primary, less than 4,000 votes are likely needed to win the primary. 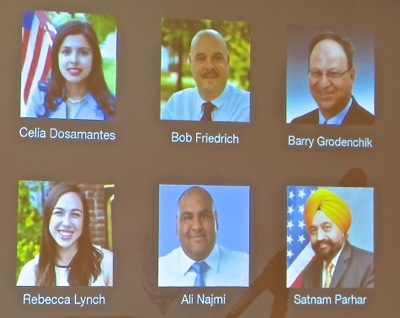 Using the candidates’ web presences as proxies, the Lynch, Dosamantes, Friedrich and Parhar web presences indicate that they do not have the in-district grassroots support required to get out the vote for an off year primary - unless their support comes from a primarily offline crowd. Grodenchik is going to get a lot of votes, in spite of the fact that it’s a primary, of an off-year election, because of the apparatus of the Queens Democratic Party Machine. Grodenchik is the most probable winner of this election for that reason alone. But that said, Najmi looks like a possible contender, who has built a tangible grassroots campaign. The questions are: 1) will he be able to sufficiently mobilize the South Asian and other ethnic groups to cast their votes for him to be their voice in City Hall on Thursday, September 10th, and 2) will he be able to overcome the ethnic name presences of not just one, but two, other candidates on the ballot? Welcome to 21st century politics and the workings of the Queens Democratic Party Machine. The NYC primary elections are Thursday, September 10th, and the results should be available later that evening. Here's a link to the NYC polling places in Queens. Many thanks to the candidates for attending the event. Many thanks to the two moderators Richard David and Linda Lee [see photo at right]. And many thanks to the sponsoring organizations which include: Chhaya CDC, Asian Pacific Association Voice, Asian American Legal Defense and Education Fund, Citizens Union, Indo-Caribbean Alliance, Korean American League for Civic Action, Minkwon Center for Community Action, New York Immigration Coalition and the South Asian Council for Social Services. Last, but not least, a very special thanks to all of those voters in the audience who took time out of their busy lives to participate in the democratic process by making the effort to inform themselves - because without an informed electorate a democracy cannot work. "If a nation expects to be ignorant and free - it expects what never was and never will be." Please vote on Thursday, September 10th.